10 of the best cases for your OnePlus 6T camera phone. The OnePlus 6T is one of the best camera phones around at the moment. However, with almost no bezel around the screen and a camera that protrudes slightly from the back, all of which is bad news if you drop it, so a case is a must. The good news there is that there are plenty to choose from, but some are a lot better than others and you need to consider what features you want. Is it just protection, or do you want, say, a card slot too? 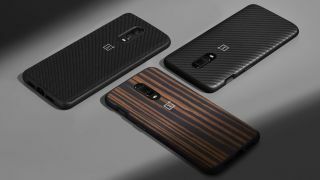 To make the choice a little easier we’ve highlighted ten of the best OnePlus 6T cases, covering various styles and budgets. The best in our opinion is the OnePlus 6T Bumper Case, but you won’t go wrong with any of these. It probably shouldn’t come as too much of a surprise that the best case for the OnePlus 6T is made by OnePlus itself. After all, what company would know the phone better? Available in three distinct styles, you can get this bumper case with either a real-wood back, a Kevlar finish or a nylon one. The latter according to OnePlus is both the slimmest and most durable of the three, but they’re all built to protect your phone, with shock-resistant bumpers to protect against impacts. They also all look good and all include precise cut-outs around the camera and ports. This OnePlus 6T case from Teeyee is incredibly slim, adding just 0.3mm of thickness to the phone (except around the camera where it’s slightly raised to protect the lens). Despite that, it’s designed to offer impact resistance and comes with an optional screen protector for all-round defence. It also looks good, thanks to a cloth material on the back rather than just plastic, and it’s fairly cheap, so if you’re feeling poor after buying your phone this is a good option. The Poetic Revolution case is both seriously tough and packs in extra features. On the toughness front, it has impact-resistant bumpers, a built-in screen protector, and port covers, so almost no part of the phone is exposed. The rear camera isn’t covered, but significantly raised edges ensure it’s still protected from drops. This case also has a built-in kickstand, letting you prop your OnePlus 6T up in either portrait or landscape orientation for hands-free viewing. It’s chunky of course, but that’s usually the price you pay for comprehensive protection. Another official option, this flip cover adds an extra layer of protection to the front of your OnePlus 6T, as well as offering a card slot, so you can potentially leave your wallet at home. It’s designed to be as slim and lightweight as possible, while still offering a decent amount of durability, and with an accurate camera cut-out you can be confident that your photos won’t be obscured. It would be nice if the case was offered in a few more colours, but if you’re happy with black it’s a good option. The DDJ Hybrid Armor Aluminum Case is largely built from aluminium, giving it a substantial, high-quality look and feel, but it also has some black TPE sections on the back, which provide some grip. There’s also a flexible TPU inner core to cushion the phone, giving the case a tough combination of a hard outer and a soft inner. Plus, it has raised edges around the screen and camera, to protect them from falls, and a port plug to keep dust out. The Stilgut Flip Case might look like a wallet case but it’s not, in that there are no actual slots to hold your cards. That might sound like a mark against it, but it’s not necessarily, as by not including slots it can be marginally slimmer than a typical wallet case. That makes it a great option for anyone who wants a protective flap over their OnePlus 6T’s screen but still plans on carrying a conventional wallet or purse. Additionally, this is a high-quality leather case, so it looks premium and classy and it’s well-made too, with precise cut-outs around the camera and ports. Spigen is a trusted name in phone cases and this is a prime example of why. It’s slim and lightweight yet still manages to offer military-grade protection, with ‘Air Cushion Technology’ providing greater shock absorption than most cases. The Spigen Liquid Air also has raised edges around the camera, to ensure that can survive a fall too, and the case has an anti-slip finish, to lessen the likelihood of drops in the first place. And while it’s made of plastic, a distinctive pattern ensures it looks more interesting than most plastic cases. Sometimes you just want to show your phone off, and for those times a case like this VRS Design one is ideal, as it’s transparent. There’s a version that’s fully transparent and another that has a black bumper, but either way most of your OnePlus 6T is on display, yet far more protected than it would be without a case. The case is designed to resist yellowing too, as well as scratches and general wear and tear, so it should remain pristine for a long time. And so should your phone, thanks to raised lips around the camera and screen, along with a shock-absorbing bumper. Elsewhere we’ve covered a flip case that doesn’t have card slots, but what if you want a wallet case that doesn’t have a flap? In that case, you probably want this option from VRS Design. Rather than a flap on the front, this has a compartment on the back that can house up to two cards, while looking like a fairly ordinary, if slightly chunky case. There’s a gold strip at the bottom that contrasts nicely with the otherwise plain black back, and the material is designed to offer a smooth texture that’s pleasant to hold. The case also sports an accurate camera cut-out, so it won’t obstruct your photos. This Anccer Ultra-Thin case is about as basic as cases get, but it stands out in two key ways. For one thing, it’s very cheap, and for another, it’s exceedingly slim. So if you want to add the absolute bare minimum weight and thickness to your OnePlus 6T this is a strong option, especially if you’re also hoping not to spend much. This Anccer case also has raised edges around the camera, provides better grip than just grasping the phone itself, and comes in a range of colours.